A brush fire broke out near Santa Margarita Lake late Sunday afternoon and burned more than 100 acres. As of Monday morning, the blaze has burned 120 acres and is 30 percent contained, according to Cal Fire. 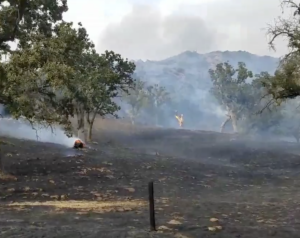 The fire started at approximately 4:59 p.m. near Santa Margarita Lake Road and Pozo Road. Fire officials initially said the blaze was spreading rapidly. Later Sunday, with the help of rain and retardant lines, forward spread of the fire had been stopped. Firefighters are currently dealing with steep terrain and heavy vegetation as they battle the blaze. Strong winds have also caused difficulties for fire crews. Officials issued evacuation orders for three ranches but later lifted them. Currently, Pozo Road is closed between Rinconda and River Road. Authorities are only allowing residents in the closed-off area. Personnel from a variety of agencies are assisting Cal Fire.